Makes reaching bath tap nuts & basin tap nuts easy. Adjustable pivoting head with hardened steel jaws. Fits 1/2" and 3/4" nuts. Adjustable Basin Wrench 280mm is rated 3.5 out of 5 by 13. Rated 4 out of 5 by Illfate from good little tool Made replacing basin taps so much easier. Spring loaded jaw is a good idea. Rated 4 out of 5 by Vectian from Makes an awkward job easier. 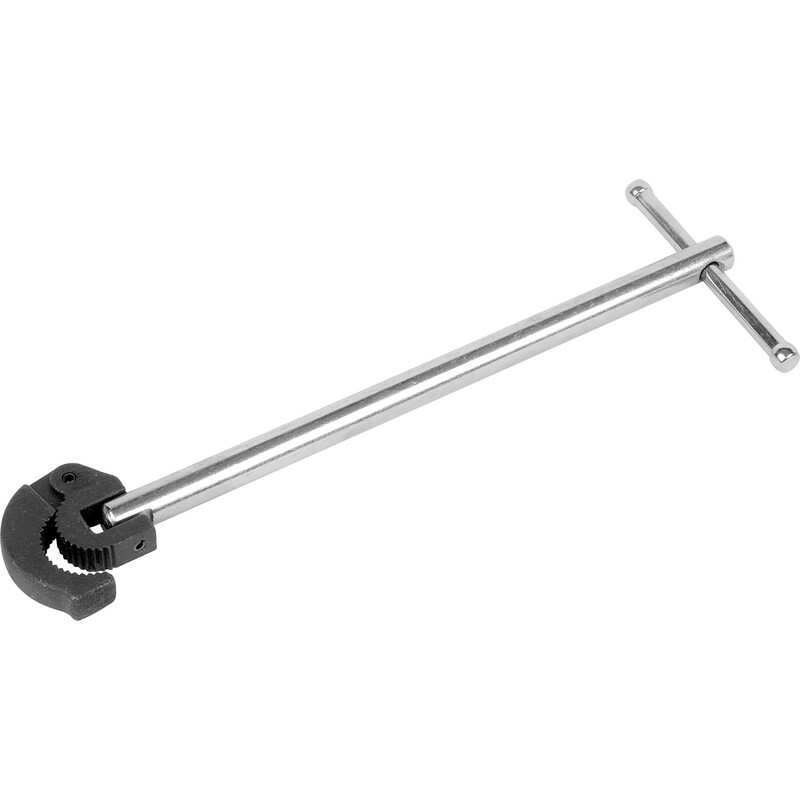 This tool is relatively simple to use and, apart from the slightly too slender cross bar which flexes slightly under load, does the job it is designed for. Rated 3 out of 5 by Farweasel from Can handle Sink taps IF it'll fit, not Bath taps Wanted to use this on a jammed bath tap fitting but it couldn't grip the 22mm pipe nuts - just kept slipping. Had to buy a bigger version from Plumbers merchant for that. But I kept this anyway figuring it was slimmer & would be useful for fitting matching sink taps (where space is smaller). But the space was too small for this tool too. D'oh. I would recommend it but with a degree of caution. Rated 3 out of 5 by mudhut from Works but a box spanner is better Buy and use this if you cannot get a box spanner onto the back nut because this tool may slip into place and grip at a slight angle. For the uninitiated: the head is reversible so that the tool will grip for tightening and releasing the back nut so you have to use it the right way round to make the jaws self-tighten or you'll think it does not work at all. The spring on the jaws is quite strong and in restricted places may be difficult to hold open while they are placed in position over the back nut. Grips well on brass and plastic. Not fully tested on 3/4" back nut but it does fit. Jaws do not close enough to grip on the 1/2" flex-pipe tap connector nut I had but look like they might on a conventional 1/2" non-flex tap connector. This is a pity because the same access problems occur on the tap connector as for the tap's back nut. It almost gripped for me and a small redesign to increase the length of the serrations nearest the hing would have enabled this. So it works but the box spanner (also reviewed) available here is superior in every respect except maybe if you have to get at a back nut at a slight angle. Rated 2 out of 5 by mds03 from ajustable basin wrench 280mm unlucky to have faulty one that was too stiff to ajust & use,otherwise would have been ok,but borrowed one at time to do job so although offered good customer service 7 replacement took refund for now,other items ordered ok.so have only rated this on my item this time as unable to use & refund ok,so sure would be ok,just unlucky batch/item this time. Rated 4 out of 5 by 99 Mustang from Reasonable Price Never used one before doing my own plumbing due to Cost of Plumbers.Easy To Use Good Value.